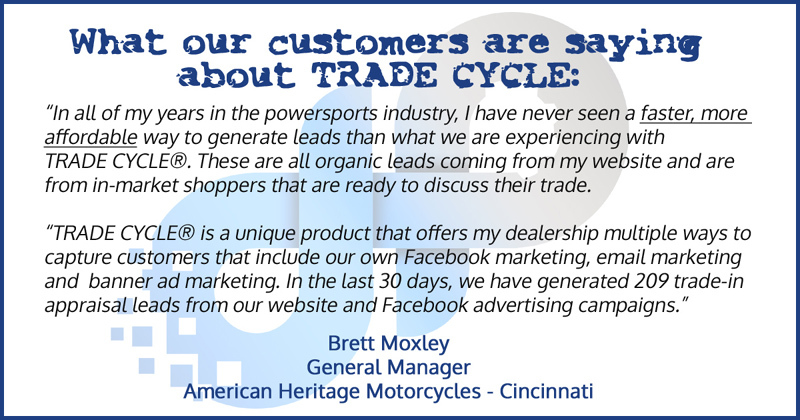 American Heritage Motorcycles – Cincinnati began receiving appraisal leads with TRADE CYCLE on December 1, 2015. When measuring the last 30 day period (Jan 17 – Feb 16), AHM converted 209 trade-in leads! To date, they have received over 300 leads. This is a new record, last set by San Diego H-D with 170. AHM – Cincinnati, like San Diego, has also figured out their strategy of using Facebook, email and ad marketing to work for them. American Heritage Motorcycles was founded in 2013 with two simple goals: First, to build motorcycle dealerships that deliver the best customer experience in the industry by treating customers with respect, keeping our promises, ensuring that all of our products and services deliver real value, and, resolving issues honestly and quickly in the customer’s favor. Second, to create a working environment that attracts and develops the best people in the industry by creating opportunities for personal and professional growth, treating every individual with respect, and emphasizing teamwork. Because it’s the right thing to do.